18. View taking in the Sunken Lane and part of the Irish Brigade's line; the Brigade's right-hand regiment the 69th New York guided themselves on the Roulette Farm Lane in the foreground, advancing across the screen from the left. 18. 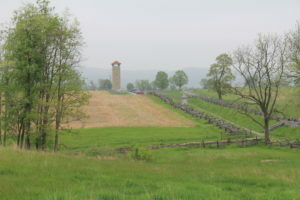 View taking in the Sunken Lane and part of the Irish Brigade’s line; the Brigade’s right-hand regiment the 69th New York guided themselves on the Roulette Farm Lane in the foreground, advancing across the screen from the left.